aspirations of its people. Years after the desire for a better future inspired the promise of a new direction, Libya has entered a destructive cycle of political instability, economic hardship, and foreign meddling. Unfortunately, under these circumstances bloody clashes and power politics have overshadowed a focus on the future of the Libyan people. It has been deeply disheartening to witness the deteriorating conditions of our homeland. Like all Libyans, I hope reconciliation prevails so that we can turn the page on the past and reach a peaceful co-existence. 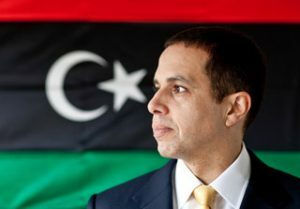 As a Libyan who loves his country and cares for its interests, I remain committed to a better future for our nation. If the Libyan people choose to restore the U.N.-recognized 1951 Constitution of Libya (as amended in 1963), we will have a strong foundation for a new beginning. We will be putting into place a system that guarantees extensive civil and political rights under the laws of an independent Libyan state. This Constitution of Independence contains the unifying mechanisms necessary to restore stability, national unity, and Libyan identity. This includes a Parliament that, in accordance with the will of the Libyan people, can amend the Constitution to adapt its principles to our current realities so that the crises of the past are not revisited in the future. We hope to move forward to a new path for the Libyan people – a path based on accountable governance, security, economic growth, the protection of citizens’ rights, and the restoration of the Libyan national identity and dignity so that Libya can play a constructive role regionally and internationally.